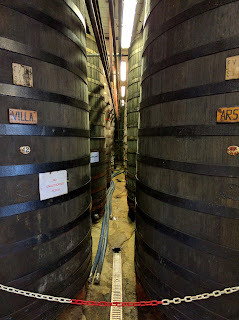 After spending an intense day and a half helping my very good friends at Little Pomona bottle up a batch of their cider, it was instructive to go and see Westons at Much Marcle, who are most decidedly at the other end of the spectrum, both in size and in their practice. The site is visible from quite a distance, thanks to the dozens of vast storage tanks which give it something of the air of an oil refinery. 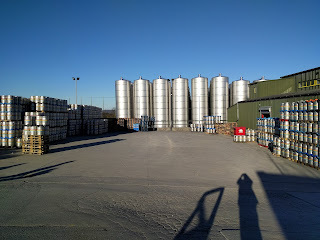 These 200,000 litre tanks hold the pressed, sterile filtered juice so that Westons can ferment and produce all year round. The tour is an interesting mixture. It begins in the older buildings dating from perhaps a century ago, and the emphasis is on traditional production methods; there's even a stone mill wheel on display. But then as we move through the production area we see, for example, a press as big as a house (granted, only a small holiday chalet, but I do literally mean a press as big as a house). And then again, a series of giant wooden tuns huddled together, somehow seeming to have a cathedral-like air to them. Westons are very proud of their modern production methods. 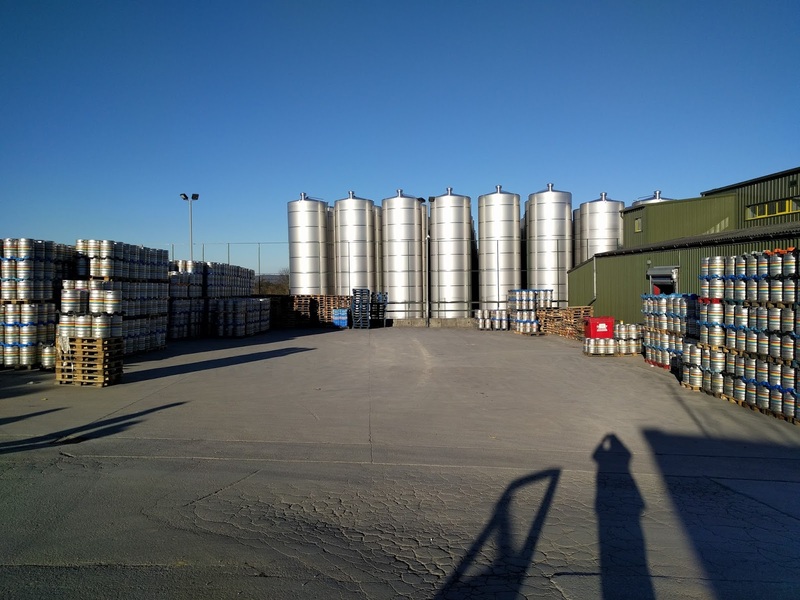 All the apple juice they press is passed through a micro filter to remove any trace of yeast, and then stored in the giant spaceship booster tanks until it's needed for fermentation, thus allowing them to produce continually all year round. 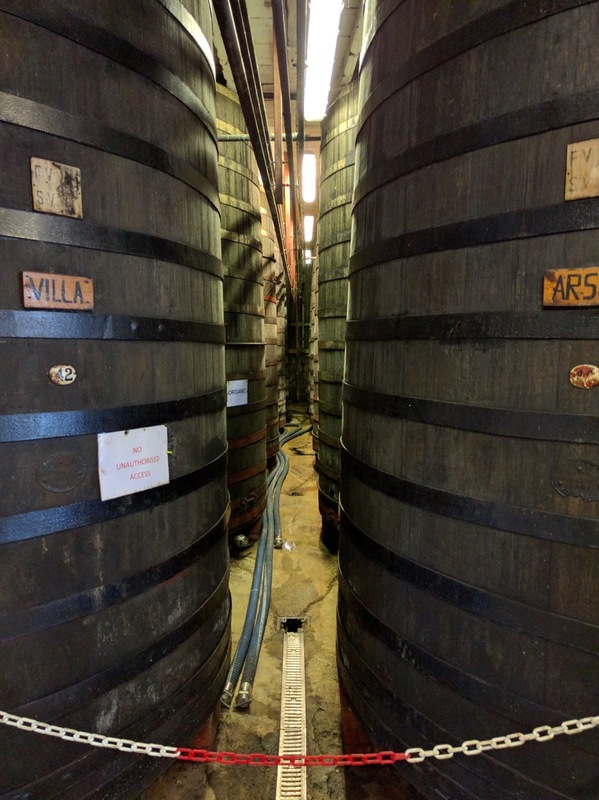 The juice is then fermented to a strength of 11%, in the pictured wooden vats, after which it is blended to whatever strength is required. It's a curious mixture of modern and traditional. Fermenting in wooden tuns, yet sterile filtering the juice. Much of what Westons produce is sweetened, but then many small craft producers also accept the market demand and sweeten some part of their output. 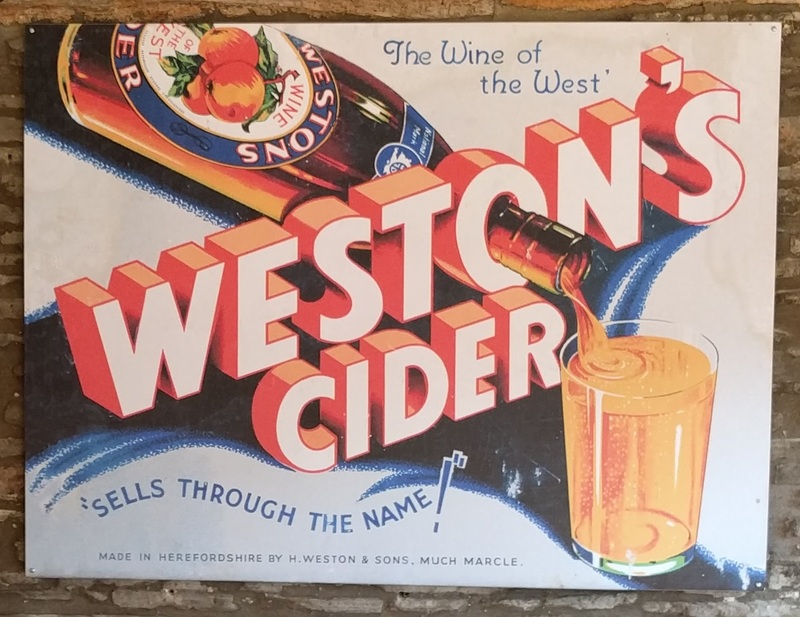 And Westons do make some very good vintage, oak-aged cider. As you can perhaps tell, I'm in two minds about Westons. I'd far rather have a funky single varietal cloudy cider from Tom Oliver or Ross-on-Wye, but on the other hand if they grew big enough to be available in Sainsbury's, the liquid would very likely not be as interesting. I think the way to look at Westons is rather like Guinness or Lagavulin. They're all big, heavily marketed brands, but if you go into an otherwise uninspiring pub and see them, then you know you've got something decent to drink. Perhaps not amazing, but good enough.